Experienced and equipped to handle your Shipping container towing with the precision necessary to safely transport your container and its belongings. 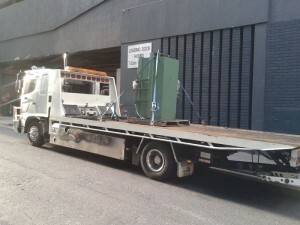 Southside Towing Sydney provides the quality required to safely transport your goods. Containers are a way to store and transport belongings; and while they provide ease in themselves, the necessary equipment and knowledge are necessary, or the container will not be transported safely. The result will likely be damaged. Heavy lifting equipment is necessary, just as large trucks and technicians that have the experience to load properly, position, and transport the containers. The job is one that takes a great deal of power, and one that must be handled properly, or injury and damage will result. Typically, flatbed trucks are the choice of transport for containers as they provide the space necessary to transport containers. Only the most knowledgeable towing company experienced in towing containers should be considered. Moving containers is not a job for amateurs. There is a risk during loading and transporting, and while the load must be properly loaded, the drivers must be knowledgeable and seasoned container towers for road safety during transport. Southside Towing provides safe and reliable transport for containers. At Southside Towing, our towing meets the requirements of our customers and the highest standards in safety codes and regulations. We are container towers that move containers with precision and safety, eliminating risks and damage to the properties of our customers. Our trucks are equipped with hydraulics and all the latest equipment specific to the industry for containers to be properly loaded, positioned, and transported. Stability and balance are necessary, and at all times, safety must be the priority. While the containers withstand a great deal, improper handling of the containers will result in damage. Southside Towing has the skills and equipment to provide quality container towing. Southside Towing provides affordable container towing. While we are competitive in our pricing, we are not amateurs in the business. Quote to the contrary. We are an experienced container towing company that is equipped to provide quality services at affordable rates. Our team is one that is dedicated to providing our customers with the best experiences when having their container towed. When we are your choice in a towing company, you have a team that only consists of the most knowledgeable, skilled, and experienced towers that will transport your container safely. When Southside Towing is your choice in a towing company, you have the expertise to tow your container, reducing the risks of any damage that may occur. We are experienced in container towing and have the dedication to our customers to provide damage free towing. We are experienced in the industry and have a crew that is equipped to handle container towing. Our equipment is up to date and well maintained, and our teams are experienced and skilled, offering the safety and knowledge required when towing containers. With Southside Towing, you have a container tower that will transport your container and its belongings safely from one destination to another. We take the care to ensure that all aspects of the towing are properly handled for the safest transport. Apart from container we handle, prestige, Accident and show car towing. To obtain a quote, please contact Southside Towing at the number below, or fill out our online form at the top right of this page.